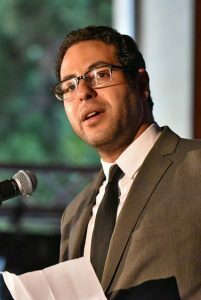 Emad Salem oversees Battery Dance’s finances and operations, global programs, and monitoring and evaluation. His previous experiences include advising and consulting NGO’s, multilateral organizations, and governments on public diplomacy, capacity development, education development, research methodologies, and strategic development. During his tenure at Battery Dance, Emad has led Company tours of South America, Europe, Africa, and China. He has lectured on the social impact of the arts, cultural diplomacy, evaluation, and arts administration at universities around the world and has spoken at conferences and symposia hosted by the Foreign Policy Association, World Policy Institute, 92Y, and the USC-Annenberg School of Communication, among many others. Emad holds a Masters, with a focus on Economic and Political Development, from Columbia University’s School of International and Public Affairs, and a Dual Bachelors in International Studies and Economics from American University. Emad is originally from Cairo, Egypt and is proficient in Arabic.